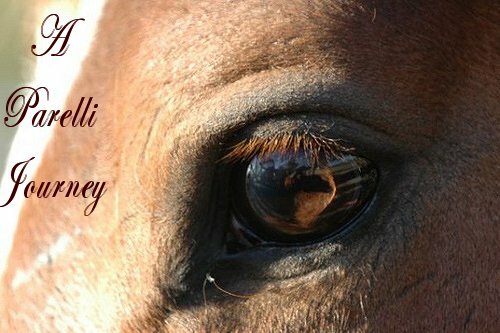 Bundy & Sante's Parelli Journey: How Interesting! Doesn't it feel fantastic to make progress? To have a hunch on something, and give it your best go, and to come out the other side?! I was happy to find Sante at the front of the paddock today, not right out hte back like he normally is, and when he saw me, he busied himself with trying to impress me.. by picking up sticks and hiding behind trees... it was a very funny catching game this morning. Anway, we started with lots of extreme friendly, I was wondering whether the carrot stick in Z5 was freaking him out when he is on adrenaline, and spent a good 10-15 minutes standing in all his zones and playing friendly, mixing it with a little bit of extreme friendly here and there. I have decided that for the time being, all circling game involving the canter will be done in the round yard... to save me rope burn, its not the ideal, but I have a feeling that Sante isn't so much afraid of the roundyard... more.. doesn't want to do anything involving using adrenaline, because he doesn't know how to act on it. So - Forward into the fray! We did some sideways, and lead by the tail, lead by the leg, hind quarter disengage towards, lots of "other stuff" so it wasn't about the circling game. When I did start circling, he was mildly RB, not sure what put him off, it was a bit breezy, and he was a bit jumpy, so I just sent him on the circle and did change of directions until he calmed down, bought him in, and he was completely LB again. So, we did lots of transitions, got him thinking - walk to trot, trot to walk to stop, all of that, with lots of rests and friendly inbetween. I am trying really hard to not stress the canter, I don't want him to see the round yard as "the place where i go crazy because mum makes me canter". When I did ask for the canter I was AMAZED at the results. My phase one, was lift my leading arm, he IMMEDIATELY picked up speed, so I gave him half a lap of that, then I flicked WAAAY out behind him with the carrot stick and - canter! He didn't maintain it, so I had to ask again, but WOW what a difference, it wasn't a "climbing the walls trying to get out" canter, it was much more controlled, fast.. but controlled. The first few times I asked for the canter he had a LOT of trouble maintaining it, so I found myself following him around the circle and "clucking" him on to maintain gait.. .not something i really want to do. I ended up with the carrot stick in Z5 and half "lunged" him round, but also found that I could take it away, and THEN ask for a downwards transition and he would respond. It only took a few goes, and he was able to maintain gait..
Once I started asking for the canter, we were only in the roundyard for another 10 minutes... I was able to firmly establish the canter cue, I then gently put pressure on his nose, encouraging him to keep his nose tipped to me, pushing his shoulder out to put him on the correct bend, then, my next goal was to ask for a downward transition before he broke gait - Which I did! We managed a trot to canter, canter to trot, trot to canter, and then canter to trot, all using nothing more than a phase 2, and with that, I bought him in, heaped the friendly on him, and left the round yard. The roaring success of our session today, gives more credence to my beleif, that I really don't think Sante knew how to canter on a 22 ft circle. When I asked, his body was all wrong, bent completely the wrong way, nose out, shoulder in and practically climbing the wall. My problem was I was misreading it as a RB fear response 'to much pressure" "can't handle it" and to be perfectly honest, in the early days that may well have been the case! But on Sunday, each time I asked for the canter, and then bought him in, he was Left Brained! I spent 10 minutes TEACHING him how to bend on the circle, nose tipped towards me, pushing the shoulder out with my carrot stick. He then had three days to think about it, and I got the fantastic results today. I only had to remind him today, to tip his nose in. I am so proud of my boy, for what he has taught me.